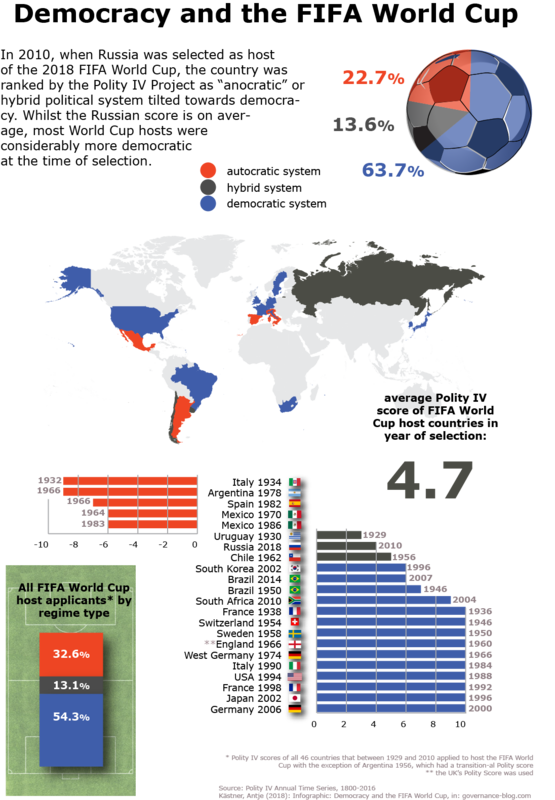 19/06/2018 0 comments on "Infographic: Democracy and the FIFA World Cup"
In 2010, when Russia was selected as host of the FIFA World Cup, the country was ranked by the Polity IV Project as “anocratic” or hybrid political system tilted towards democracy. Whilst the Russian score is on average, most World Cup hosts were considerably more democratic at the time of selection. Following a secret ballot in October 2010, FIFA’s executive committee named Russia and Qatar as hosts of the 2018 and 2022 World Cup soccer tournaments, thereby deciding in favour of two nondemocratic countries. The decision came amid allegations of corruption and bribery, especially by British and American commentators. In 2018, the 21st FIFA World Cup is taking place. As the competition in 2010 was hosted jointly by Japan and South Korea, there are to date 22 FIFA host countries. The time span between the host’s selection and the actual World Cup has varied greatly. Uruguay, for instance, was only announced in 1929 as host of the 1930 World Cup. Meanwhile, Spain’s hosting of the 1982 World Cup was announced sixteen years in advance, in 1966. When examining the Polity Scores that the 22 World Cup host countries had when they won the bid, we see that the vast majority, 14 countries or 63.7%, was in fact democratic. Another five countries were autocratic, while only three were located in the middle of the regime spectrum. The average Polity Score that host countries displayed at the time of their selection is 4.7, i.e. anocratic or hybrid with a tendency towards democracy. With a score of 4 in 2010, Russia was, thus, very close to the average Polity score of FIFA host countries. But as such, Russia is rather the exception than the rule. Since the mid-1980, all FIFA-hosts were democratic, many of them scoring 10. Earlier, however, a handful of autocratic countries had been selected, which lower the average score. Particularly striking with a score of -9 is Italy (1932) under Mussolini and Argentina (1966) under military rule. The three hybrid hosts are all tilted towards democracy: Uruguay 1930, Chile 1962, and now Russia 2018. But in 2022, the FIFA World Cup for the first time in forty years will be hosted by an autocratic country. However, Qatar is not any autocracy. According to Polity, it is a fully-fledged -10 autocracy! This revival of nondemocratic hosts has various reasons. Nondemocratic leaders are in constant need of securing popular support. At the same time, they are less accountable to citizens. Therefore, the governments of resource-rich nondemocratic countries invest large amounts in sports and try to attract sporting events. This explains why the share of autocratic countries among the 46 FIFA host applicants considered here, was with 10% considerably higher than that among the actual hosts. FIFA-officials, in turn, welcome investments in sports and security, and were, at least in the past, open to corruption. In contrast, the governments of democratic countries are more and more under scrutiny when spending large amounts on sporting events – the protests accompanying the 2016 Summer Olympics in Rio de Janeiro and the no-vote in the referendum on Hamburg’s bid for the 2024 Summer Olympics being cases in point. Following the FIFA corruption case in 2015, the organisation in 2017 approved enhanced regulations for the bidding process. Apart from requirements concerning stadiums and infrastructure and principles of sustainable event management, host countries also need to engage in human rights and environmental protection. If FIFA takes this seriously, we should expect that future World Cups be hosted by democracies.